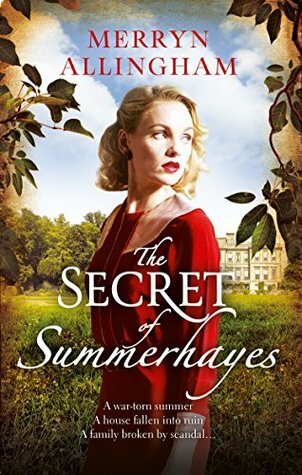 In January I enjoyed reading The Buttonmaker’s Daughter by Merryn Allingham and hoped there would be a sequel, so I was pleased when Midas Public relations on behalf of the publishers offered me a review copy of The Secret of Summerhayes. I was hoping this would follow on from The Buttonmaker’s Daughter, which ended in 1914 at the beginning of World War One as I wanted to know what happened to the characters during the war, but The Secret of Summerhayes is set in Sussex in 1944 just before and during the D-Day landings in Normandy. So, forty years have gone by and only Alice Summers remains as one of the main characters. Alice’s daughter, Elizabeth had disappeared at the end of the first book and Alice is still hoping, forty years later, that she will return, especially as she has recently received anonymous letters that she thinks are from Elizabeth. The two books are only loosely connected and I think that they can both be read independently. It’s hard to assess but maybe I would have enjoyed this second book more if I hadn’t read The Buttonmaker’s Daughter, as I kept hoping to find out more about what had happened to Elizabeth in the intervening years. Summerhayes has changed, what is left of the gardens is overgrown and the house, except for an apartment for Alice, has been requisitioned by the Canadian army and an entire battalion had taken possession of the estate. Beth has been employed to look after Alice, now an old lady in her eighties, still sharp in her mind, although she is very disturbed by the anonymous letters and other unexplained accidents. The only other members of Alice’s family are Gilbert Fitzroy, her nephew and his young son, Ralph, who live at the neighbouring estate of Amberley, where Alice had lived until her marriage. This is a slow-paced novel as Beth gradually learns a bit about the history of Summerhayes and in particular some of Elizabeth’s story and about the difficult relations between the Summer and Fitzroy families. I think knowing what had happened in 1914 meant that some of mystery and tension just wasn’t there for me. Beth becomes friendly with two of the Canadians, Eddie Rich and especially Jos Kerrigan, although she doesn’t want to get too close to Jos as the planned invasion of France draws nearer. Her relationship with Gilbert also complicates matters. As in The Buttonmaker’s Daughter, the Italian garden plays a major role, but I think what eventually happened was rather predictable (I wonder though if I would think that if I hadn’t read the first book?) The characterisation is good and I liked the main characters very much. Although my knowledge of the events of D-Day is limited it seemed to me that the author has done her research and incorporated the facts seamlessly into the narrative. A list of sources and an author’s note would have been helpful. Interesting, isn’t it, Margaret, how our reading of one book influences our reading of another. That’s happened to me, as well. I do like the sound of the setting and that old house – almost as though there are ‘ghosts from the past.’ Glad you enjoyed the characters. Margot, the setting is good and it was interesting to see how the house had changed – sad really.